Popcorn is one of my main snack food groups. I seriously love the stuff! So when Casper reached out asking how I would celebrate National Popcorn Day, I was super excited to find out about this lovely “holiday”. As if I needed another excuse to eat an entire bag of Skinny Pop (sorry I’m not sorry…)! As the sleep startup looking to bring the perfect mattress, sheets and pillows to everyone, Casper suggested celebrating the holiday with a movie night in. This sounded perfect to me as the January freeze has settled in here in Boston! This time of year MJD and I can often be found binge-watching shows on Netflix, like Making a Murderer and catching up on the hit movies we missed throughout the year. 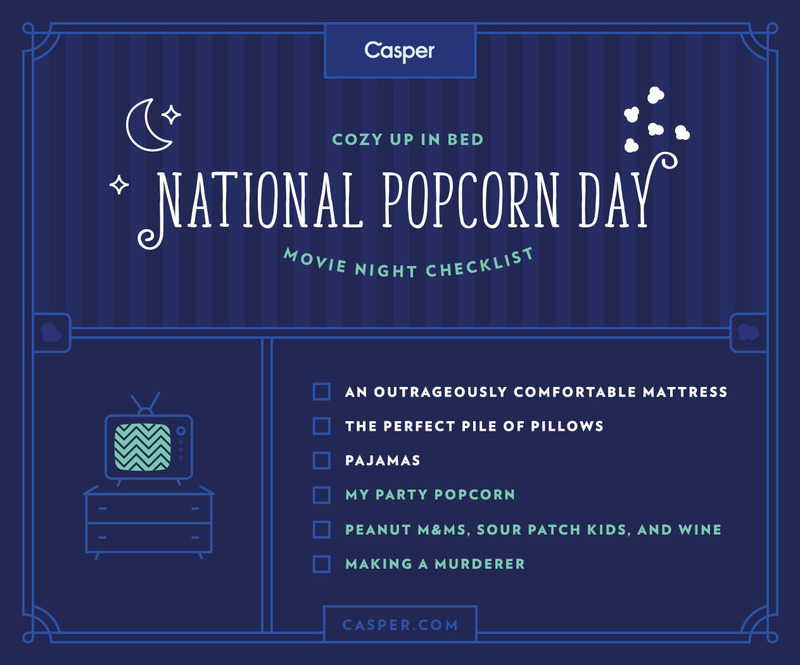 By checking off our movie night checklist and making my party popcorn, I know MJD and I will have a cozy, fun and yummy night-in! 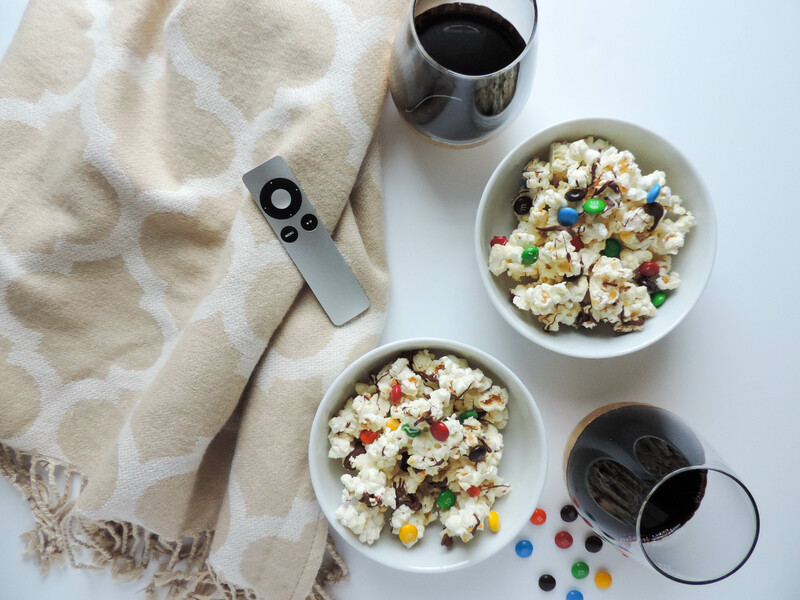 Your turn- What are your movie night essentials? Are there any shows you think we should add to our watch list? FYI: This post was created in collaboration with Casper. All opinions are my own. What ?! This is a holiday!? Throwing some m&ms into our popcorn tonight – nothing like a sweet & salty mix! Love me some sweet and salty! I can pretty much get behind any food related holiday 🙂 Glad you were excited about this one too! Aw, I am sorry to hear that, Kait! Feel better soon! xoxo! That sounds like the perfect night in- I love popcorn! I can’t wait to check out your fun recipe! Thank you 🙂 Let me know what you think of it! Oh how fun! Wish I had seen this post yesterday because my mom practically lives off of popcorn. Thanks for stopping by Erica! I love popcorn too! Fun! I love popcorn too. Our movie nights usually involve some sort of cheese tray. Have you watched Broadchurch yet? We binge watched that last winter. I haven’t seen Broadchurch yet, Will have to check it out! Thanks for the recommendation, Meghan! Love this post! Popcorn is my everything – no movie night is complete without it! How did I miss this holiday!?! Popcorn is my favorite!! I love caramel with cheesy popcorn and such!! Yum, yum!! So much yum! I love caramel too! xoxo!